There are many things other the actual games that have actually improved in London over this summer. One was the wonderful Africa stage at the BT River of Sound, just before the games started (may cover this later). 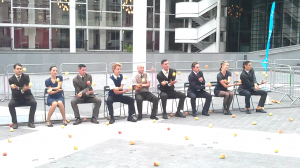 Another is the totally surprising ‘Exhibition Road Show’ (more info here), a series of street theatre events and food stalls on Exhibition road leading from the V&A up to the Albert Hall. On Monday, on my way to the proms, I happened across these chaps. 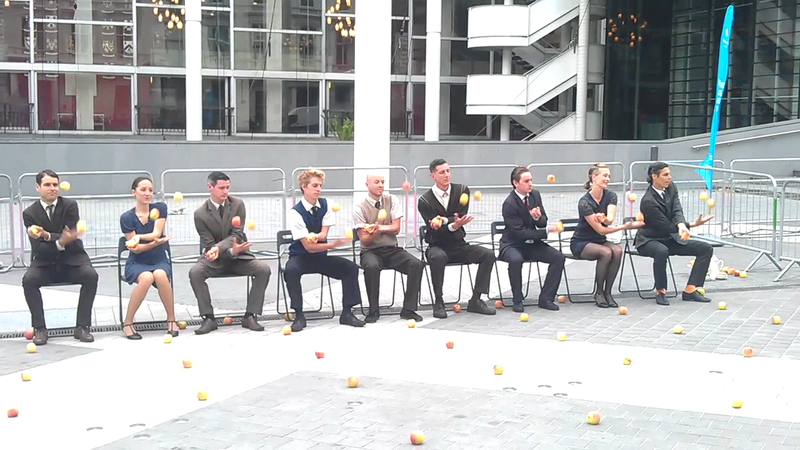 They are called ‘Gandini juggling‘, and I urge you to see them live whenever you can. In the meantime here they are on video. Click the ‘play’ arrow, and the blue bar will indicate downloading (move the cursor a little if it stops showing). Then click the ‘play’ arrow again, and it should run. It’s in HD, so if you click the little expansion icon on the far right, it should play full screen should you so desire. Enjoy. By the way, if you like this video, I found that the piece is part of a complete show called 'Smashed', which is playing all over Europe. Details of their tour dates are here, and from that I see they are playing in Birmingham on 26th August 2012, and in Canterbury on 21 October 2012. I may well go to Birmingham to see them again. That's how good they are (anyone who knows Birmingham will appreciate this).